Find time to read this book. Many of the greatest pleasures and healthiest habits we can practice require chunks of time set aside to simply let thatevent or moment unfold. If you cannot find time to sit down at dinner with your family you are not allowing for those special, funny moments to spontaneously happen. If you cannot find time to practice a healthy strength or nutrition habit it doesn’t matter how perfect or correct that habit might be for you. Your habit to focus on is to simply find time today. Look at whatever scheduling system you use and see where, when, how you could easily set aside 5 minutes to simply read the rest of this book over the next few days or week. After you finish reading this book pick another habit (just 1) that you could easily include in your daily life. Hint, there are 52 to pick from in this book. Rinse and repeat until you’ve done everything in this book – or you’ve achieved your movement and nutrition goals. Write in this book, make notes, use it as a journal. Bring these habits to life through your daily actions. Schedule 5 minutes each day to read this book and/or practice 1 of your favorite habits from this book. What if there were no “good foods” or “bad foods”? What if we reconsider foods as “information”? Some foods provide information that gives positive feedback and makes us feel better. Some foods do the opposite and make us feel worse. Using this approach can help us have better options and approaches towards food and help improve our nutrition. Taking this idea one step further means that we simply look to make better food choices. What we eat is not a “right or wrong”, 50/50 choice now. Instead, we look for the slight improvement. A practical way to incorporate this into a habit is to replace instead of eliminate something that you are already doing. A quick way to do that with food is to continue eating your usual food choices. However, replace that lesser quality food with something a little healthier. What does that look like? While it’s sound advice, it is really hard to go from eating McDonald’s egg Mcmuffins five times a week to only eating organic vegetables and egg whites! Incorporate Habit 35 (learn to cook 1 meal) and use that in conjunction with this habit. You could still eat that breakfast sandwich- just make it yourself and use better quality ingredients now. Avoid the processed meats or suspect quality fake cheeses and breads that fast food chains probably use. Instead, find a local butcher that offers organic turkey and/or grass-fed meats with cheeses from grass-fed cows (a much healthier option). So in the end you aren’t eliminating the breakfast sandwich. You are replacing it with a healthier – and probably tastier – version. The main idea here is that you do not have to stop eating what you normally eat…instead simply focus on ways to improve what you are eating. There’s a lot of information out there. But “having information” is not the same thing as “being informed”, meaning that you have processed, analyzed, and developed a thoughtful understanding of a situation. It means applying a critical perspective and as much of the scientific method as possible, and using evidence-based judgements. So I offer this habit on supplements and digestion as a starting point for you and your doctor/healthcare provider to begin a conversation about what supplements, if any, could help you feel better. The below list is a good start. Probiotic – the human intestinal tract contains trillions of to begin, in a healthy person, coexist with us in a beneficial, a situation. They help digest food, produce vitamins, regulate metabolism, and control a normal immune response. Probiotic bacteria promote a healthy intestinal environment by producing lactic acid and by secreting fatty acids that are helpful to the growth of other beneficial microorganisms. Digestive enzyme -Aging, illness, and the overuse of antacids can contribute to insufficient secretion of hydrochloric acid and pancreatic enzymes, resulting in incomplete digestion of food. This maldigestion can result in various health problems, including nutrient malabsorption, digestive problems(such as gas, bloating, and diarrhea), and vitamin deficiencies (particularly of the fat-soluble vitamins). Curcumin – People throughout Asia have benefited from the healthful effects of curcumin for centuries. Curcumin is the orange pigment in turmeric (the primary ingredient in curry), and is an antioxidant that offers numerous health benefits, including supporting joint health and hepatic, GI, and cardiovascular function, by helping to maintain the body’s normal inflammatory response through optimization of cytokine production. Ginger-Ginger is a leafy plant that is native to warmer parts of Asia and is cultivated in many countries, including India, China, Nepal, Nigeria, Thailand and Indonesia. The plant’s root is used widely for both medicinal and culinary purposes. Although it’s used most frequently to treat digestive issues, such as nausea, vomiting, gas and indigestion, ginger has also been shown to provide muscle and joint support. Begin a conversation with your doctor/healthcare practitioner to discuss if and how supplements could be beneficial for you. If it helps, I’ve been using supplements from ThorneResearch for years now and find them to be of high quality. The first part of this habit means that you should spend some time reviewing the first 25 habits so far. What was useful to you? Why? What did you struggle with? Why? What is it like to revisit that material now? What were the most important lessons to you in your own practice? Why? What things will you save for reference and return to later? Each emotional and mindset based habit so far was designed to be manageable and very “do-able” for anyone at any stage of life with their IBD. Going forward we hope for improved mindset, nutrition, and movement. In the future that will be unique and specific to each individual. What interested you — and what might you like to pursue further? What was missing — and where might you find out more? What new direction has this book inspired — and how might you go in those directions? What are your “next steps” and “action plan”? Give yourself the time and space to “look back, look forward” at where you were and how you felt in the past. Now see yourself in the near future – where do you want to go? How do you want to feel while you live – and thrive – with your IBD? Your carbohydrate choices can be very personal and specific with IBD. While bagels, bread, pasta and other processed carbs can be considered unhealthy choices what is one to do if they are the only foods that do not cause gut distress? Ideally, we would hope to eat a healthy source of carbohydrates from fresh, organic fruits and veggies. Steaming and cooking veggies can improve your ability to digest them. Pureed fruits can help alleviate issues with seeds that can cause gut irritation for some. Explore options that fit your situation and nutritional needs. Remember that you don’t need to eat every fruit or vegetable in the world. If you can find just a few that help improve your gut health stick with them! Review the list of vegetables and fruits in the Resource section to build your rainbow. Living with IBD can teach us that major aspects of life (like our health) can be outside of our control at times. While we may not be in complete control of our health we can control more than what we may believe. Perform this exercise and you can discover that it will be more important to focus on what you can control and easier to let go of things that you cannot. 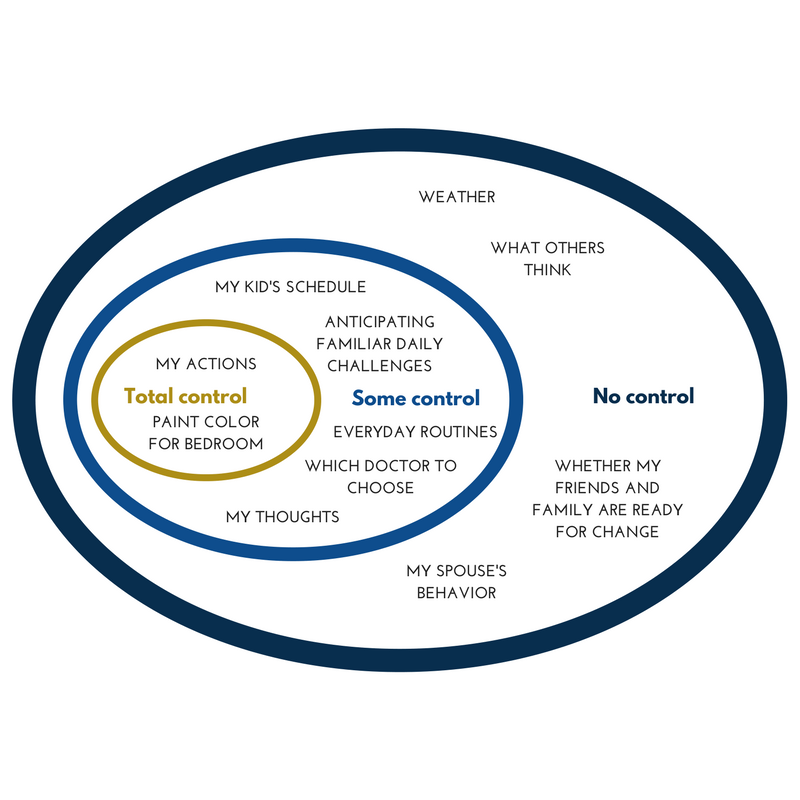 What in your life do you have total control over? What do you have some control over? What do you have no control over? Complete and review your diagram. Test your evidence for each one. Food intolerances usually occur when the gut reacts poorly to a specific food or ingredient used in food preparation. Intolerances can result from the absence of an enzyme needed to fully digest a food, such as with lactose intolerance. If you suspect you may have a food sensitivity, it’s important to first rule out the possibility of a true food allergy. This can be done with your physician. If you suspect you may have a food intolerance, keeping a diligent food diary/response log can help find the offending foods quickly and remove them. Because of the delay between food ingestion and response, it’s easy to ignore food intolerance symptoms or simply accept them as part of life. If any of the symptoms listed in this article are part of your normal day, you might look at your food intake to see what might be causing the problem(s). Keep a food journal, taking special note of how you feel after eating the foods listed above. Also, talk with your doctor to learn more about investigating into if you may have a food intolerance or allergy.